by Carrie ~ Kosciusko, Miss. A while back, I was going through a Bible study called The 7 Experiment (by Jen Hatmaker) and was challenged by a quote she used from author Shane Claibourn, “I had come to see that the great tragedy in the church is not that rich Christians do not care about the poor but that rich Christians do not know the poor…I truly believe that when the poor meet the rich, riches will have no meaning. And when the rich meet the poor, we will see poverty come to an end.” This was so true of my American life— I didn’t truly know anyone poor. Sure, we all know people that have less than we have, but do I have a real relationship with someone considered “poor” by the world’s standards? Then I went on my first trip with HMM and I learned to care about the poor because I fell in love with them. My first trip was to Barahona, Dominican Republic over spring break with a group of youth and adults from our church along with my husband two oldest daughters who were 6 and 8. It was such a thrill to see them connect with many of the kids surrounding the HMM compound and play games without any concern for languages or status. Three sisters became some of our girls’ closest friends. These sweet girls were always smiling and playing, but we could tell that there was very little at their house. Each day one would come over without a shirt on or without pants on, and anytime candy or food was given out their little hands were pushing through desperately. So like any American mom, I wanted to meet their mom and know about their family. They were excited about a new baby brother and really wanted us to meet him. So, off we went following them ducking through barbed wire fences and across backyards (We later found we could have gone around on the street, but this was the kids’ normal path.). There we met Ingrid (the mother) and the girls’ two-month-old-brother, Daniel. And poverty was given a face for me. Here was a mother of four kids ages 8 and under, one an infant, her husband had left recently, and she was trying to care for them while living in two small rooms that were divided from another family’s side of the tin house by a cardboard wall. A sheet hung to divide the front room from the beds in the back and open shelves displayed their few belongings. Knowing we were going into town later, I asked what sizes the girls were and what they needed. Her reply was beans and rice and if possible a little oil. My head just spun — who cares about what the kids clothes look like when she doesn’t know if she is going to be able to feed them that day? It was so far from my reality I had trouble even wrapping my mind around it. In the Dominican Republic, $100 a month can help ensure an entire family has one good meal each day. 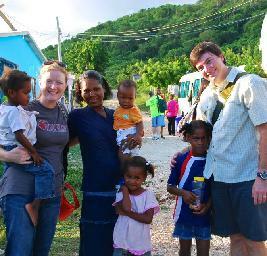 Since then we have made several more trips with HMM to Barahona and Haiti, each time being able to check back in on Ingrid’s family. We are humbled to see God at work, the kids growing and healthy, and other improvements in their situation through HMM’s family sponsorship program. They are involved with El Camino church and all three girls are going to school. On our trip last September, Ingrid insisted on sharing her specialty sweet bean soup with us as well as many of the neighborhood children crowding at the door. It was delicious. I am so humbled to see how people with so little of what the world deems necessary can be so joyful and generous.